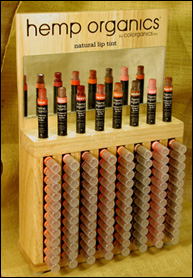 Colorganics, based in San Francisco, has developed a beautiful range of organic lip products over the last 9 years. 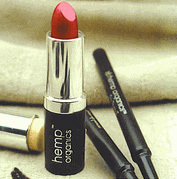 Careful blending of organic oils, and waxes with natural pigments, has delivered a sensational selection of lipsticks, liptints , and liners under the ‘hemp organics’ brand. ‘Karma Gloss’ lip gloss has been added to the range for the women who just can’t be without their gloss. Yes, these moisture filled, creamy lipsticks do stay on! Maybe not for 12 hours but do you really want the chemicals in your body that provide that in commercial lipsticks ? The range is 100 % natural, and approximately 90 % of the ingredients are sourced as certified organic. These lippy’s are attractive packaged and priced to be affordable. Whether it’s bold colour or a sheer shine you want, hemp organics and Karma Gloss help you feel fresh and beautiful.